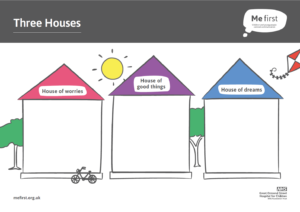 The Three Houses tool is a resources used widely in health and social care to help a child or young person identify things in their life they feel positive about, things they are worried about, and what their hopes and goals are. Whilst this technique has been used by Social Workers in a child protection setting, it can be readily adapted for working with children and families in a health setting and those facing challenging medical issues or procedures. This resource has been adapted by Me first from the original Three Houses tool developed in New Zealand by Nicki Weld and Maggie Greening.